On the Temperance card, there is an angel with wings, whose gender is not immediately obvious, which suggests that there is a balance between the sexes. One foot of the angel is in water, to represent the subconscious, while the other foot is on dry land, a representation of the material world. On her robe, there is a square, which has a triangle inscribed inside, another echo of the tangible earth in union with the holy trinity. She holds two cups in a manner where she can mix the waters, which represent the super and subconscious minds. The water flows between them, suggesting union and infinity. Everything about this card represents balance, the perfect harmony that comes from the union of dualities. Her advice is to test any new waters, before jumping into the deep end. In moments where there is anxiety or great stress, you have been able to remain calm throughout. You are a person who has mastered the art of not letting things get to you, and this allows you to achieve much progress in all areas you seek out to explore. The Temperance tarot card suggests moderation and balance, coupled with a lot of patience. Where this card appears, there is the suggestion that extremity in any situation is to be avoided. The Temperance tarot card suggests moderation and balance, coupled with a lot of patience. 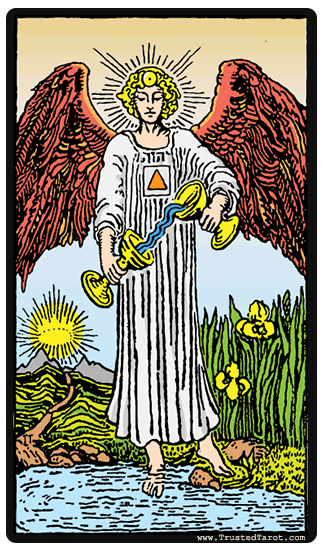 The Temperance card implies that you have a clear vision and know what you want to achieve. This is an indication of higher learning, which is a critical attribute in the journey of life. It reflects that you have found peace with what you are doing and everything is unfolding as it ought to. The Temperance card, in relation to other people, shows that you are able to adapt and work in harmony with your community, your coworkers and your loved ones. Your calmness in all matters gives them comfort and puts them at ease. Temperance may also indicate a time to evaluate and re-examine the priorities you have chosen. This will help you create a balance between your outer and inner self. At the end of it all, you will find greater purpose and meaning in your actions, for her message is that we cannot live fully in either. Temperance in reversed is a reflection of something that is out of balance and may be causing stress and anxiety. The real meaning of the Temperance card can be deciphered using the other cards in the spread to identify areas where this imbalance is being caused. A Temperance in reversal may also be used as a warning; if you take a certain path, it would lead to turbulence and excess. Lack of a long-term plan or vision may also be the Temperance reversal meaning. This creates a lack of purpose for you, leaving you feeling lopsided as you search here and there for what you should be doing. You must reflect and think carefully about what needs to change. Temperance reminds us that all things are only good in moderation, and that we must examine in which aspects of our lives we are breaking the balance.